TODAY'S SERIES FINALE: The Louisville Bats go for the series win Sunday against the Gwinnett Stripers in the final game of a four-game series at Louisville Slugger Field. On Saturday for "Thunder At Slugger" Day, the Bats re-branded as the Derby City Mint Juleps and defeated the Stripers by a 3-2 score in front of a sold out crowd of 13,638 fans. Louisville goes for its second series win in a row, after taking 2 of 3 from the Columbus Clippers at Huntington Park from April 8-10. 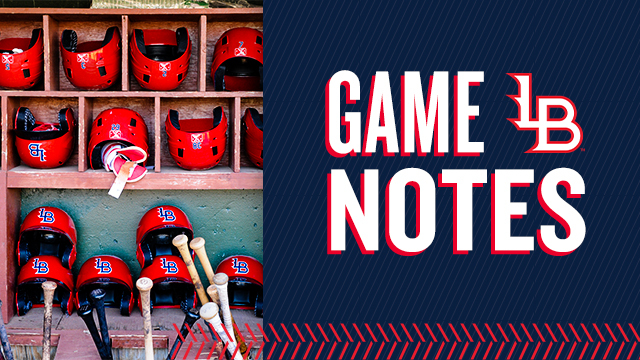 AGAINST GWINNETT: Coming into play Sunday, Louisville has won 10 of its last 11 home meetings against the Stripers. In the series matchup since 2017, the home team has won 15 of the last 16 games, with the lone exception coming this past Friday as Gwinnett prevailed, 9-7. Saturday marked the series' 80th all-time matchup, with the Bats holding a narrow 41-39 lead since the matchup began in 2009, when the Atlanta Braves' Triple-A club relocated to Gwinnett. BACK-TO-BACK IN APRIL: With a win today, the Bats would have back-to-back series wins. Louisville has not done that in April since the 2016 season, when it won back-to-back 3-game series against Norfolk and Durham from April 24-29. Last season, Louisville did not win back-to-back series until June 22-27, taking 2 of 3 vs. Norfolk (6/22-6/24) and 2 of 3 at Columbus (6/25-6/27). AGAINST ALL ODDS: The Bats won on Saturday despite a number of factors counting against them, with Louisville neither scoring first nor out-hitting its opponent. Gwinnett led 1-0 after a leadoff home run by Rafael Ortega, and out-hit the Bats 7-5. The Bats also did not hit a home run themselves, earning their first win of the season when failing to hit a homer. Last season, the Bats finished 19-42 in games where they did not hit a home run, and 26-48 when they allowed a home run. In games where both occurred, they finished 6-23. NOW THAT'S QUALITY: Right-hander Jose Lopez (1-0, 1.80) got his first win of the season, tossing 6.0 innings and giving up just one run, a leadoff home run, allowing 4 hits while walking 2 and striking out 4 on 89 pitches (55 strikes). It was just the second quality start for a Louisville starter this year, joining Keury Mella (4/6 at Toledo). It was also Louisville's first win this season when its starting pitcher provided a quality start. In 2018, Louisville went 36-12 when getting at least 6.0 innings and 3 or fewer earned runs out of its starting pitcher. STRENGTH OF SCHEDULE: Through 10 games this season, the Bats' opponent has been above .500 for 9 of the 10, and technically every possible game, with the lone exception being when a record-less Louisville and Toledo squared off in the first game of the season. In 2018, Louisville played 80 of its 137 games against teams above .500 (58%; 33-47), 9 games against .500 teams (7%, 4-5) and 48 games against teams below .500 (35%; 24-24). WALK IT OUT: First baseman Brian O'Grady went 0-for-2 on Saturday, but drew 2 more walks, bringing his season total to 9. He is currently tied for the league lead with Columbus' Mike Freeman and Toledo's Jacob Robson. In 10 games this season, O'Grady is batting .333 (11-for-33) with 6 runs, 2 doubles, 3 home runs and 8 RBI to go along with a .455 on-base percentage and 1.121 OPS. LONGING FOR .500: With a victory in their next game, the Bats (5-5) would have a winning record for the first time since July 27, 2016, when they were 53-52 after winning their 105th game of the season in a home game vs. Charlotte. IF YOU BUILD IT…: The Bats winning a close 3-2 game in front of 13,638 fans should come as no surprise; Louisville actually went 5-0 in front of their 5 biggest attendances of the 2018 season, including "Thunder At Slugger" last season on April 21, defeating the Syracuse Chiefs by an 8-5 score in front of a Louisville Slugger Field record crowd of 14,658.